Seven Gatton Academy students were recognized with awards at the Louisville Regional Science and Engineering Fair (LRSEF) on Saturday, March 2, 2019. Three of the students qualified to automatically advance to the Intel International Science and Engineering Fair (ISEF) in Phoenix, Arizona in May. 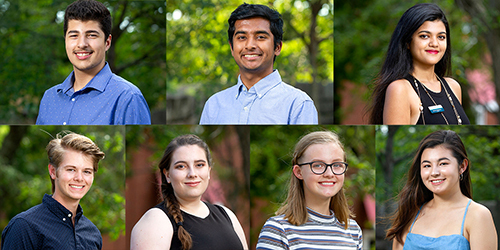 Abdullah Ateyeh, a Frankfort senior from Western Hills High School, Matthew Knerr, a Paducah senior from McCracken County High School, Lea Mitchell, a Hebron senior from Conner High School, Rithik Reddy, a Bowling Green senior from Bowling Green High School, Miriam Richardson, an Irvine junior from Estill County High School, Sasha Sairajeev, a Frankfort senior from Franklin County High School, and Elisha VanZant, a Lexington junior from Henry Clay High School, were recognized at the Louisville Regional Science and Engineering Fair. The Louisville Regional Science and Engineering Fair is an annual science and engineering fair for students in grades 6-12 from 52 Kentucky counties. In the high school division, the top four winners automatically advance to compete in the Intel International Science and Engineering Fair. Ateyeh and Reddy teamed to advance to the Intel ISEF by receiving one of the Top 4 Best of Fair spots. They earned first place in the Computational Biology and Bioinformatics category for their research, “Finding the Most Influential Factors Which Control the Healing of Chronic Wounds.” Their work was mentored by Dr. Richard Schugart of the WKU Department of Mathematics. Knerr earned second place in the Animal Science category and also received the Naval Sciences special award for his research, “Artificial Light at Night on Biometrics in Zebra Finches.” His work was mentored by Dr. Noah Ashley of the WKU Department of Biology. Mitchell earned first place in the Earth and Environmental Science category for her research, “Longitudinal Study of Water Quality in Jennings Creek, Bowling Green, Kentucky: Urbanization Impacts on Karst Groundwater.” She also received the Stockholm Junior Water Prize, the Girls Achieving Leadership through Science award from the Women Environmental Leaders of Louisville, the NOAA 2019 Taking the Pulse of the Planet Award, and the American Society of Civil Engineering Award. Her research was mentored by Dr. Jason Polk of the WKU Department of Geography and Geology. Richardson and VanZant teamed to earn first place in the Microbiology category for their research, “The Isolation, Characterization, and Composition of Novel Bacteriophages PilotOrr and Triard.” Their work was mentored by Ms. Naomi Rowland of the WKU Department of Biology. Sairajeev advanced to the Intel ISEF after receiving one of the Top 4 Best of Fair spots. Her work received first place in the Biochemistry category and the American Chemical Society’s Biochemistry Special Award for her research, “Synthesis of Platinum Anticancer Compound oxalato (1,4-dimethylpiperzine) platinum (II).” Her research was mentored by Dr. Kevin Williams of the WKU Department of Chemistry. For more information about The Gatton Academy, visit www.wku.edu/academy or call (270) 745-6565. About The Gatton Academy: Established in 2007, The Gatton Academy is Kentucky’s first residential two-year program for gifted and talented junior and seniors. The Gatton Academy’s students enroll as juniors and are full-time WKU students pursuing their interests in advanced science, technology, engineering and mathematical careers. The Gatton Academy has been named to The Washington Post’s list of top-performing schools with elite students for nine consecutive years. About the Louisville Regional Science & Engineering Fair (lrsef.org): The mission of the Louisville Regional Science & Engineering Fair is to awaken, promote, and recognize science and engineering talent among our area's youth and act as a catalyst to promote science and engineering throughout Kentucky. LRSEF serves all interested students in grades 6 -12 living in 52 Kentucky counties. Students are encouraged to register for the annual LRSEF as a result of being selected as a winning project at their school or county science & engineering fair. If NO locally accessible fair is held, any student in public, private or home school may register directly to enter LRSEF, with the support of their teachers. Winning projects advance to state and international competitions. LRSEF is one of five fairs in Kentucky affiliated with the INTEL International Science & Engineering Fair and BroadCom M.A.S.T.E.R.S.